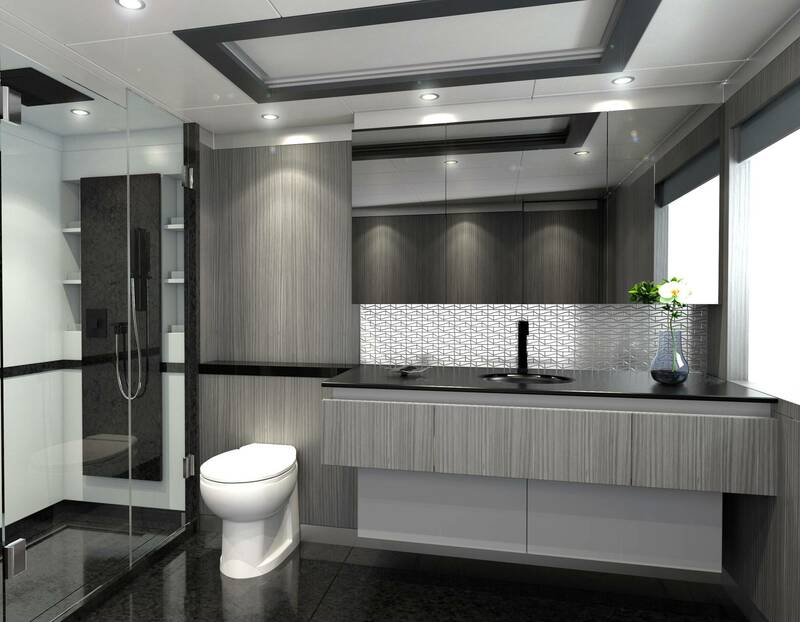 Interior renderings courtesy of AKJ Design Concepts, LLC. 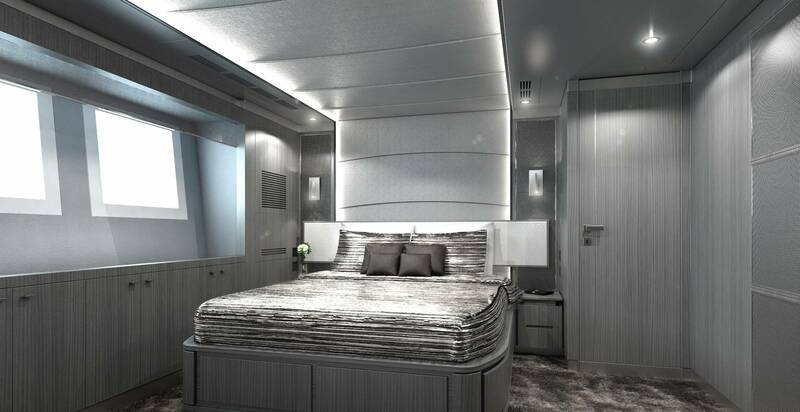 Specializing in one of a kind creations, architectural interior designer Alfred Karram Jr, has never replicated the same design in his 32 year career, although he retained the striking, cool color scheme for M/Y Ironman, his second superyacht for the same private owner. 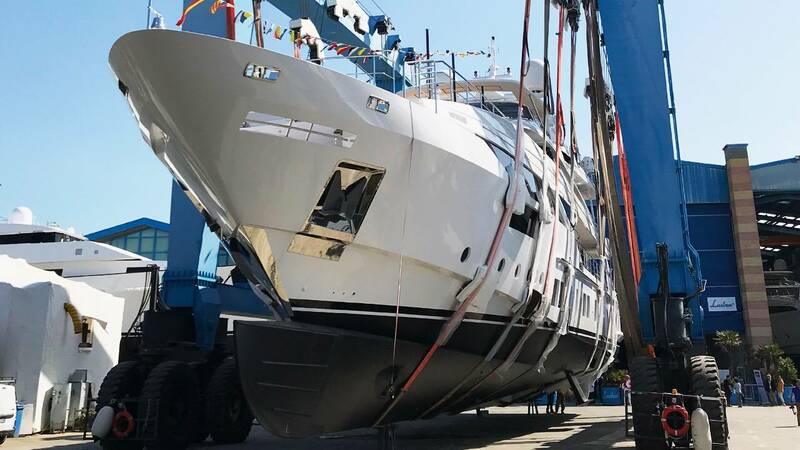 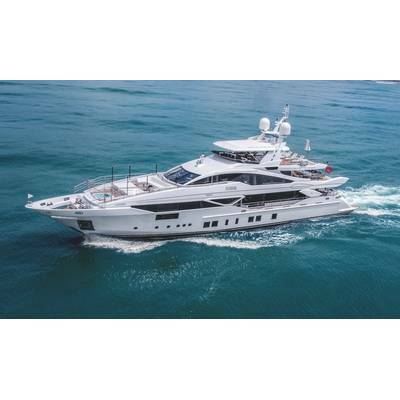 A semi-displacement tri-deck motoryacht manufactured by Benetti in fiberglass and carbon fi-ber, Ironman is 140-feet with a 28-foot beam. 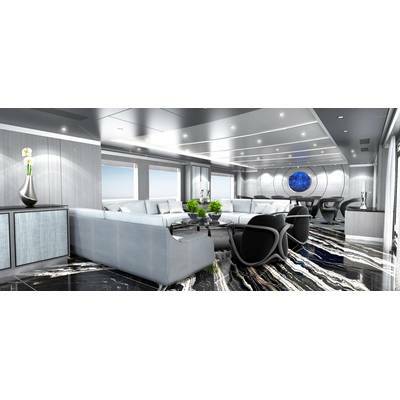 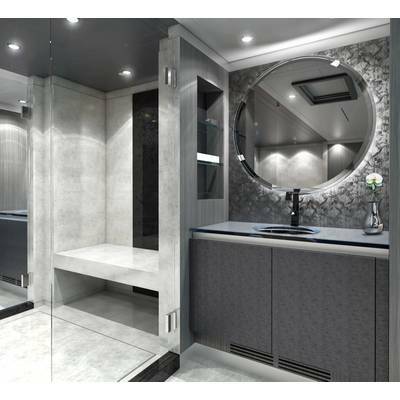 The first Ironman, a 125-foot Benetti, was nominated for a 2016 World Superyacht Award with an interior design based on rectilinear geometry. 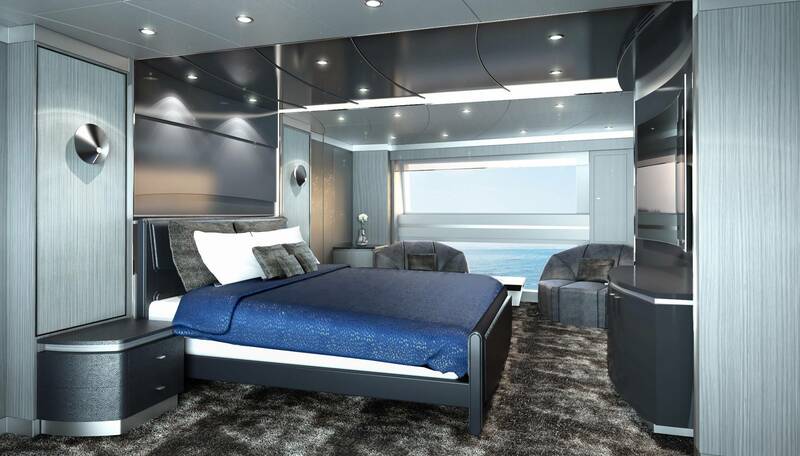 She won four out of six international awards including the ISS Motor Yacht Award and the Showboats Design Award. 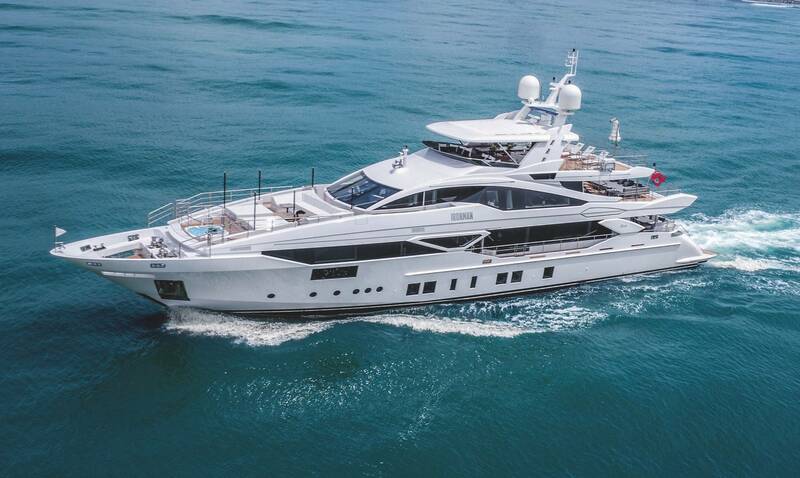 Her 2018 encore, the new, 140-foot Ironman, has a very different aesthetic grounded in curvilinear geometries. 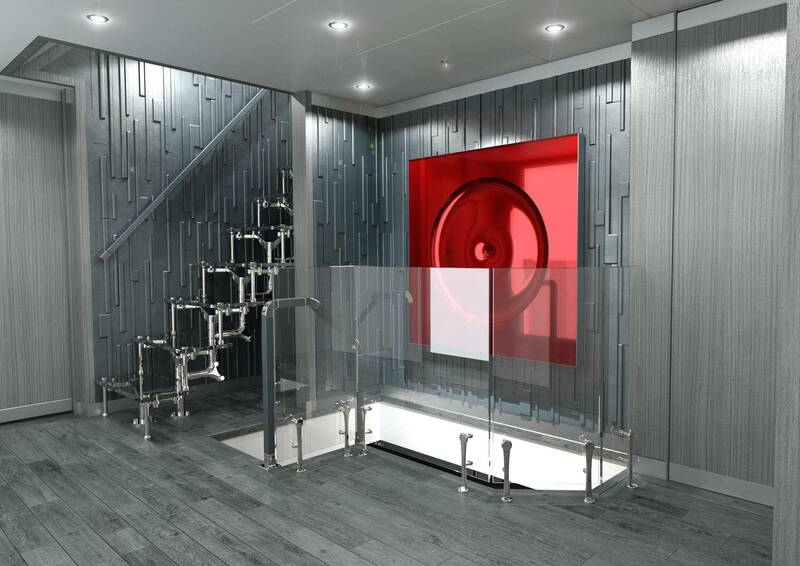 Ironman’s decidedly masculine tone is befitting to fictional superhero Tony Stark. 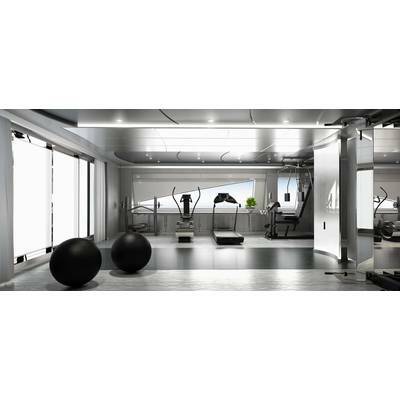 The upper deck is devoted to a complete workout gym and the entire vessel is equipped with modern, elec-tronic amenities complementing a high-tech lifestyle. 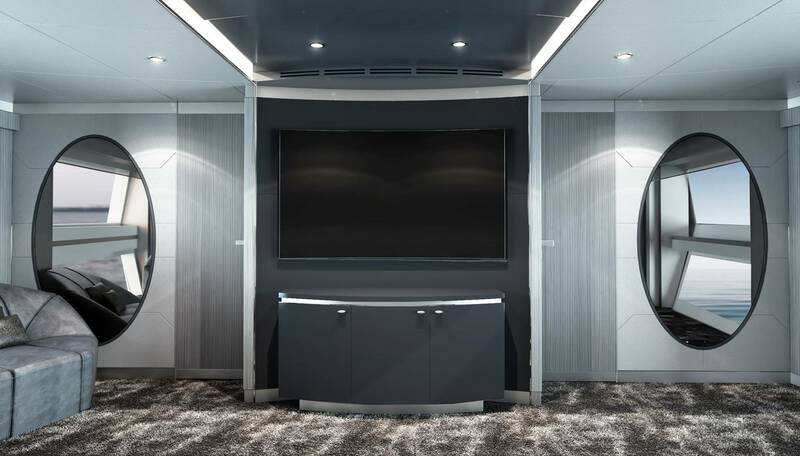 The 125’s main salon ceiling featured rectangular shaped soffits, whereas soft, elegant curves abound on the ceiling of the 140. 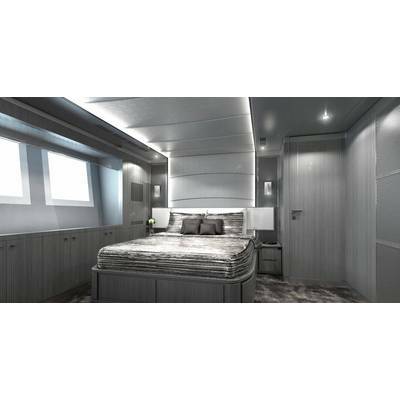 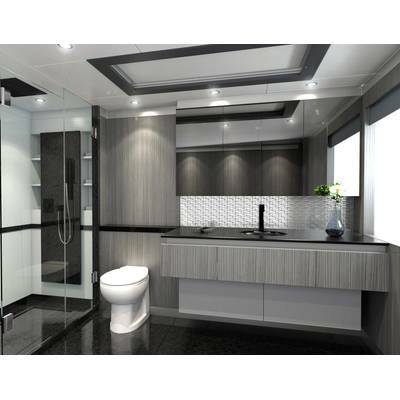 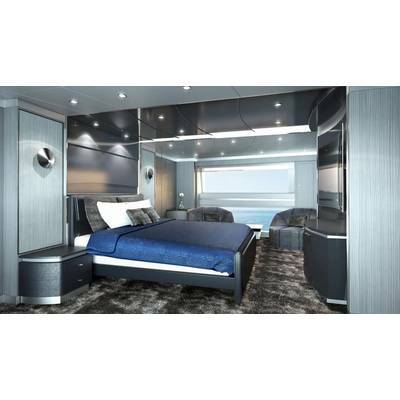 Light grey wood imbued with silver, white and blue seamlessly transition Ironman’s decks, cabins and passageways. 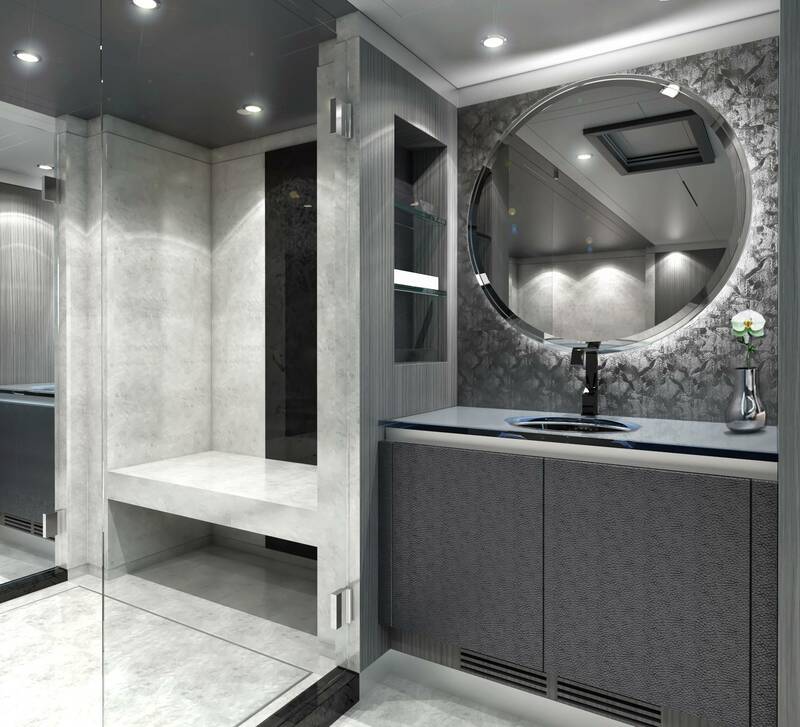 Karram makes gunmetal gray look great, combining elegance and testosterone for Ironman’s sleek, virile aura. 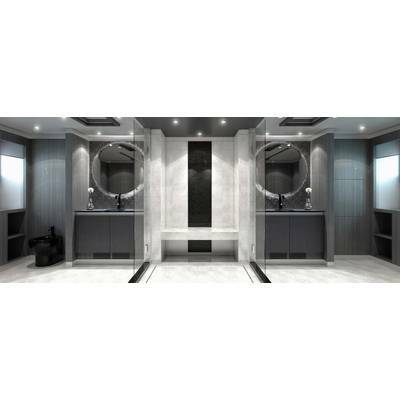 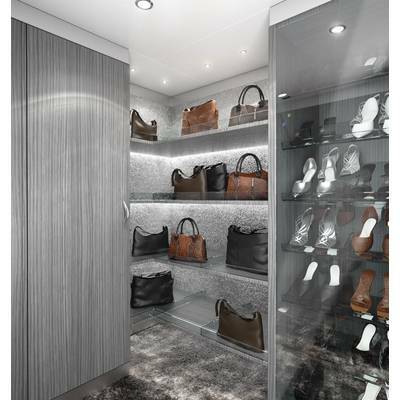 Upon entering the polished and matte lacquered salon, adorning pieces of gray, white and black textiles provide an expansive ambiance atop a completely bookmatched granite sole. 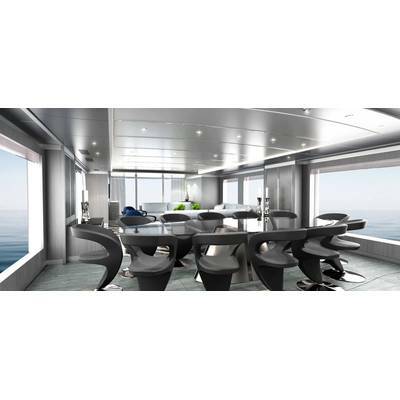 Fluid, motion-oriented architectural details include a cascading series of ceiling arcs emanating from the main bulkhead in the dining room akin to a water drop in a lake with expanding, con-centric circles. 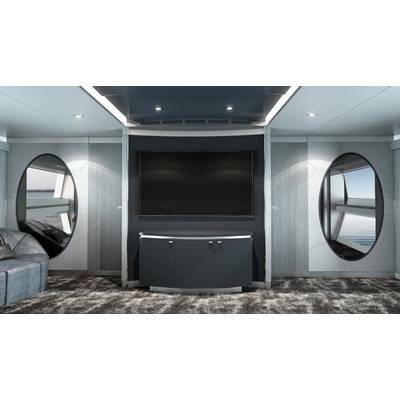 Sweeping views are enjoyed on sumptuous, two-tone gray leather furniture by Giorgetti with soft, silver Armani Casa silk upholstered panels on a bookmatched granite floor. 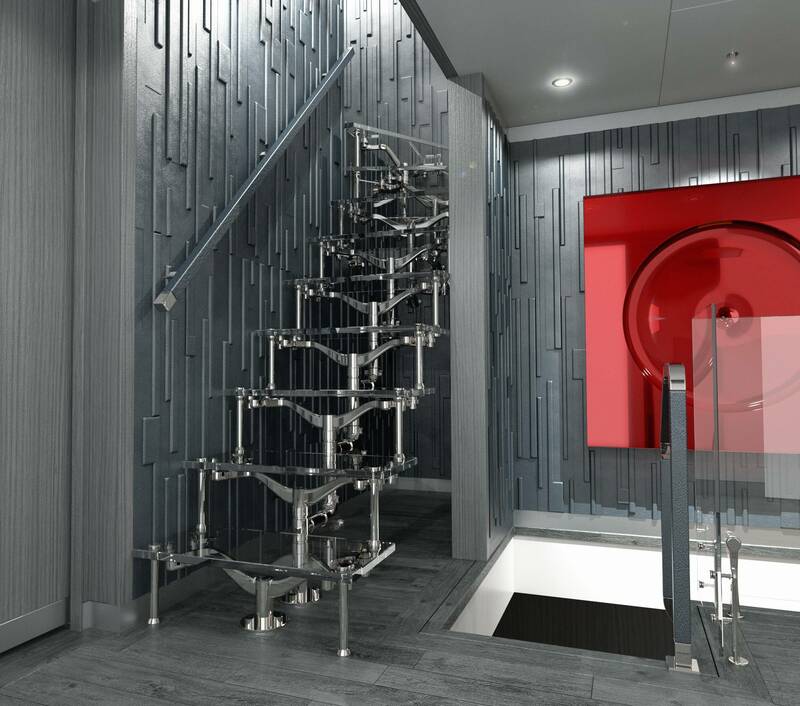 The floating foyer staircase is a dramatic feature supported by one, polished stainless steel spinal structure. 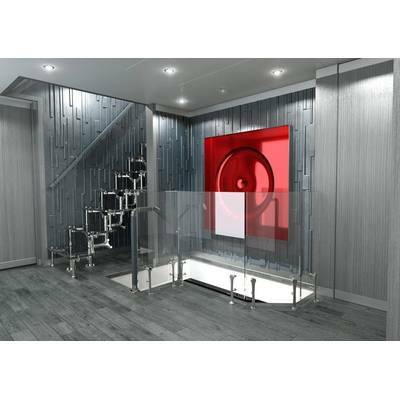 The stair treads are crystal clear with no green hue seen on the starfire glass edges. 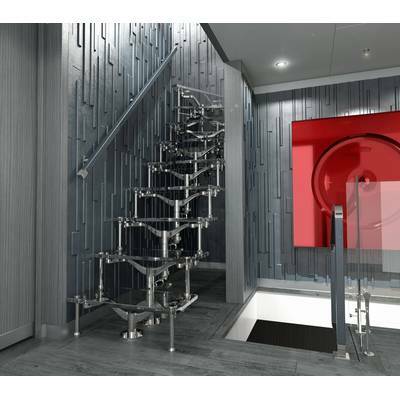 The staircase walls are upholstered in three leathers, dark, light gray and silver, creating the illu-sion of cascading rain. 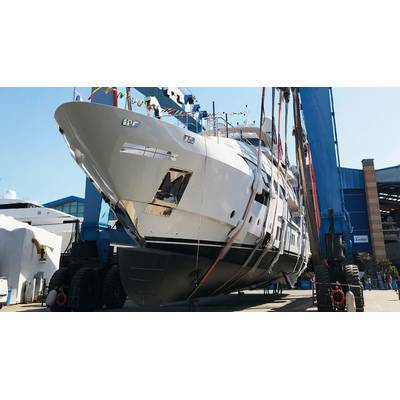 Launched in April, M/Y Ironman looks to make her world debut at The Monaco Yacht Show in September 2018.